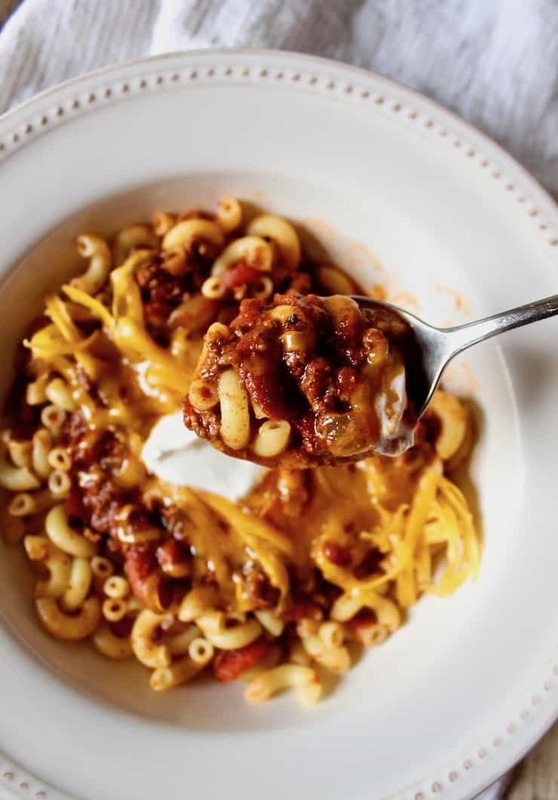 Traditional ground beef chili, packed with flavor and served chili mac style over macaroni pasta ~ pass the grated cheese, sour cream and hot sauce, please! It’s chili time! This is the chili I’ve been making for several years now, and the reason being that all members of my family like it. It’s not too spicy, it has no weird ingredients, it’s not white chili, no, this is a very traditional beef and bean chili. Chili is definitely the kind of thing kids can be very picky about. Since I am not a short order cook, I try and put something on the table that appeals to everyone. If I had my way, chili would be very spicy and made with pieces of beef chuck. But that doesn’t go over very big around here. It’s like I have to find the least common denominator of spiciness. This chili definitely has a lot of flavor but practically no heat. A couple of us just add some sriracha to our bowl to spice it up. That’s what’s great about chili. Everyone can doctor it up the way they want it. 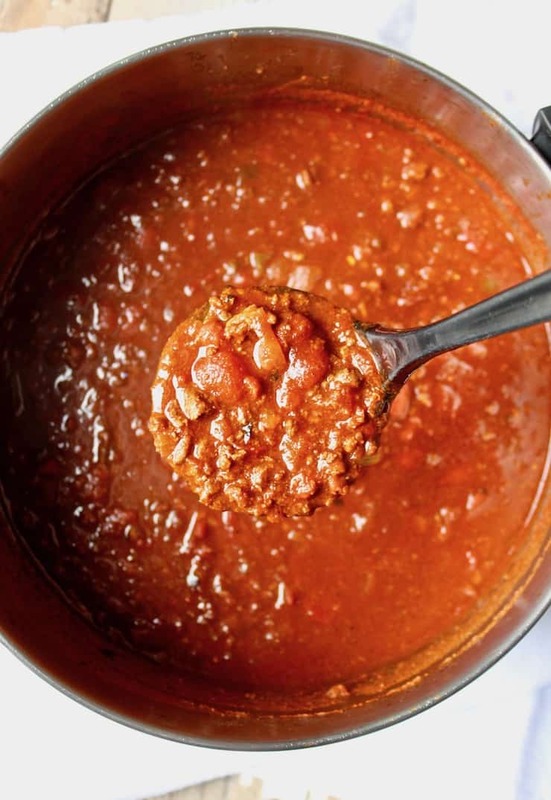 My mom made chili when I was growing up. This is not her recipe, I don’t think she had one. She just would make a pot with ground beef, onion, tomatoes, chili powder and beans. She always made macaroni and served the chili over it. She called it chili mac. I loved it. 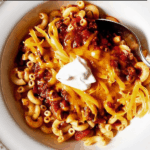 My kids like chili with macaroni, too. Picky Eater tends to fill her bowl with macaroni, a very little spoonful of chili, a bit of cheese and then a huge amount of sour cream. That’s her very strange version of chili mac. You might also like my white chicken chili or turkey chili. 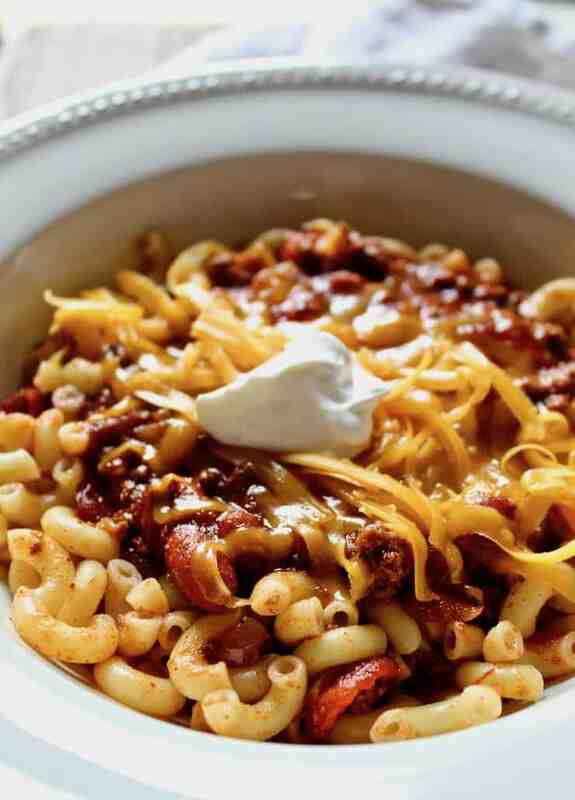 Three great chili recipes for the cold winter months. 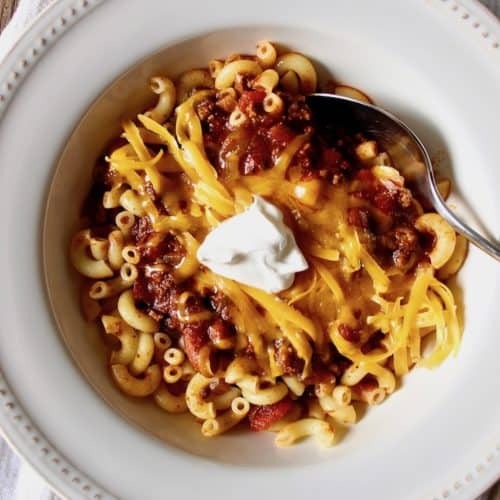 If you’ve tried this Chili Mac or any other recipe on the blog, then don’t forget to rate the recipe and let me know how yours turned out in the comments below ~ I love hearing from you! You can also FIND ME on FACEBOOK, TWITTER, INSTAGRAM and PINTEREST. Never miss a post ~ sign up for The Hungry Bluebird Newsletter for a weekly email of new content. 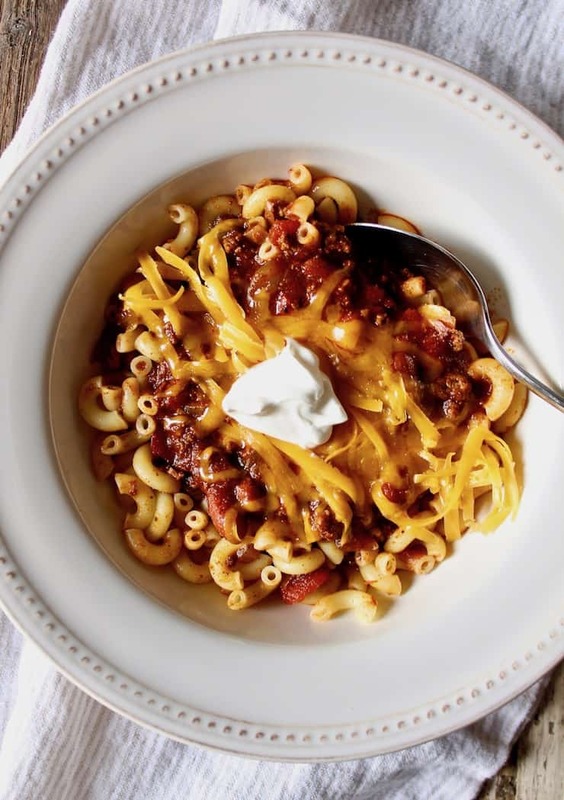 Traditional ground beef chili, packed with flavor and served over macaroni pasta. Serve with grated cheese, sour cream and hot sauce. In a large pot, cook ground chuck, garlic, onion, green pepper and chili powder over medium high heat. Stir frequently to break up meat and cook until beef has lost it's pink color. Add all of the remaining ingredients (not the macaroni!) and bring to a boil. Reduce heat, cover, and simmer for 1 hour, stirring frequently. Break up the stewed tomatoes with a wooden spoon as the chili simmers. Let the tomatoes simmer and release their juices, then, if chili seems too thick, add 1/2 to 1 cup water. For best results, make a day in advance. Makes about 3 quarts of chili. *Adapted from a newspaper clipping in my messy recipe drawer. One of my favorite foods!